Whether we acknowledge it or not, humans were created for one sole purpose; to worship and honor God while on this earth and for all eternity. True worship must come from the heart. It is both a humble and reverent expression of our love, adoration and loyalty to God for all that He is and all that He has provided us. Jesus told the woman at the well in John 4:23-24, "The hour is coming, and now is, when true worshippers will worship the Father in spirit and in truth, for the Father is seeking such to worship Him. God is Spirit and they that worship Him must worship Him in spirit and in truth." It doesn’t say we can worship God anyway we want, but we "must worship Him in spirit and in truth". The word "must" makes it absolute. There is no other way we can worship God and be acceptable to Him. Unless there’s a real passion and love for God, there is no worship in spirit. Jesus also said to the woman at the well, "Woman, believe me, the hour is coming when neither on this mountain nor in Jerusalem will you worship the Father."' In other words, it is not the location that makes an act of worship authentic. Worship is not merely an external act that you can accomplish by going to a place. Together the words "spirit and truth" mean that real worship comes from the Holy Spirit of God within us. You can choose to worship God in your house, in your car, anywhere or anytime the Spirit of God moves you. When you sing from the heart in spirit and truth, you're not singing about God, rather you're singing to Him. Truth is expressed outwardly from a heart filled with gratitude and love toward our Lord and Savior, Yeshua Ha Mashiach, Jesus the Messiah. "An hour is coming," Jesus informed the Samaritan woman, 'and now is, when the true worshipers will worship the Father in spirit and truth. 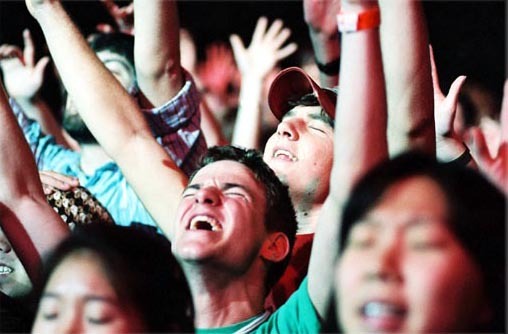 True worshipers are those who worship the Father in spirit and truth. Paul calls them "the true circumcision, who worship in the Spirit of God and glory in Christ Jesus and put no confidence in the flesh"(Phil. 3:3). It is such people the Father seeks to be His worshipers by drawing them to Himself. God desires for His children to worship Him alone freely, boldly, and passionately. Everyone agrees, Hiillsong's 'At the Cross' is the most anointed worship song for explaining the Gospel ever produced! Watch it and you too will agree. I Surrender - Voted the best worship song of 2012! Written and performed by Terry MacAlon, this beautiful worship song does a wonderful job of conveying God's holiness and the peace that comes from experiencing His holiness both in words and music. Most people know about the trinity -- the Father, Son and Holy Spirit -- but they are not clear on who the Holy Spirit is and what He does. The aim of New Wine is to introduce people to the Holy Spirit, and everything He has to offer. From 'Glory to Glory' will refresh those who are spiritually hungry for more of God and want to encounter a intimate closeness with Him. This is one of the most powerfully anointed songs. Every time I hear Paul Wilbur sing In Your Presence, I sense the veil parting and nothing is there but the Lord and myself. Worship with Don Moen and be encouraged as he sings this piano acoustic version of one of his most well known songs, "I Am The God That Healeth Thee". The Holy of Holies is a representation of heaven itself, God’s dwelling place, which we have access now through the blood of Christ. Watch in awe as actor Richard Harris portrays the Apostle John entering the Heavenly Holy of Holies as recorded this Revelation 7 to one of the greatest worship songs ever written. "PEACE I LEAVE WITH YOU; MY PEACE I GIVE YOU. I DO NOT GIVE TO YOU AS THE WORLD GIVES. DO NOT LET YOUR HEART BE TROUBLED AND DO NOT BE AFRAID." Without a doubt, this is truly the best rendition of this famous gospel song. The fact that it was sung by four tenors in the Roman Coliseum makes it even more so moving. The moment you hear this great praise song you will lift your hands and start praising God! This song was written by the Newsboys. Paul Wilbur is among the Levites of today who understands the heart of God and leads others in worship. 14 songs in all, Jerusalem Arise, filmed in Jerusalem on the Feast of Tabernacles, communicates the awesome holiness and splendor of God. It has depth in meaning and is joyful in its music. You can't just sit still and listen, you have to get up and Praise the Lord with the thousands of others in attendance at this spectacle. This is by far one of the greatest praise songs of all times! God blessed Carrie Underwood with an incredible voice—it’s so awesome to see her using it to lift up praises to Him! Watch this powerful and inspiring performance of “How Great Thou Art” by Carrie Underwood and Vince Gill. Adoni, translated Lord or God in Hebrew, is one of the greatest Messianic praise songs of all times! Psalm 122 says, 'Pray for the peace of Jerusalem. They shall prosper who love thee." Listen now as Paul Wilbur sings a worship song that calls for the return of the Sar Shalom, the Prince of Peace, Yeshua, the Holy One to return to the city of peace. Worship with Don Moen and long-time friend Lenny LeBlanc as they sing “God Is Good All The Time” acoustic & unplugged on guitar! Worship with Don Moen and his full band as he sings "Thank You Lord" in this DonMoenTV Live Worship Session accompanied by special guest Lenny LeBlanc! Listen now to one of today's most-popular worship songs that has been banned from being sung in many Presbyterian churches (Presbyterian Church (U.S.A.) because the song's authors, Keith Getty and Stuart Townend, refused to alter the hymn's lyrics from "Till on that cross as Jesus died/the wrath of God was satisfied" to "Till on that cross as Jesus died/the love of God was magnified." https://www.christianitytoday.com/women/channel/utilities/print.html?type=article&id=111430 Please dear fellow Christians - send this anointed music video to all of your Presbyterian friends! Please help fulfill the words of Jesus recorded in John 8:32 - "And you shall know the Truth and the Truth shall set You free!"